Custom Back Bar Displays powered by MRL Promotions is capable of producing a wide range of back bar displays in a variety of materials. We can create back bar displays from acrylic, metal or wood, all of which can be made into illuminated back bar displays. 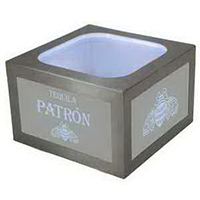 Our back bar displays are custom designed and produced per any specifications. Contact Custom Back Bar Displays powered by MRL Promotions today for your latest back bar display, beer tap handle, or wood flight tray project! Custom Back Bar Displays powered by MRL Promotions specializes in the production of illuminated bottle glorifiers and back bar displays, which are made to engage your customers and draw new clientele. Illuminated bottle glorifiers and back bar displays are popular among beer and liquor companies because of its appeal to customers. Illuminated bottle glorifiers and back bar displays can be made out of acrylic, metal or wood, and then fitted with LED lights to illuminate the product. Many companies prefer illuminated bottle glorifiers because it spotlights their product. Trust in Custom Back Bar Displays powered by MRL Promotions to create an illuminated back bar display that is representative of your company, while effectively promoting your product. Wood bottle displays and back bar displays showcase liquor and beer bottles in an attractive manner that will catch the attention of consumers. Custom Back Bar Displays powered by MRL Promotions creates beautifully crafted wood bottle displays and bottle glorifiers for a multitude of our clients. Wood bottle glorifiers and wood bottle displays can be made to meet any specification. 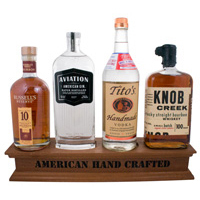 All of the wood bottle displays can be made out of a variety of wood types, such as oak, maple, pine or cherry. The wood bottle displays can be made to look more rustic with the natural wood finish or they can be decorated to any color. Custom Back Bar Displays powered by MRL Promotions is an industry leader in designing and producing high quality wood bottle displays. Custom Back Bar Displays powered by MRL Promotions offers our clients the ability to customize metal bottle glorifiers and back bar displays to your exact specifications and budget. 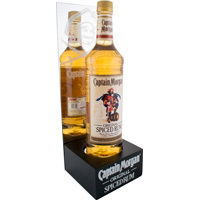 Metal bottle glorifiers and back bar displays are beautiful to look at, while being very durable. Our metal bottle glorifiers can be made from stainless steel or iron, followed by imprinting your company logo. 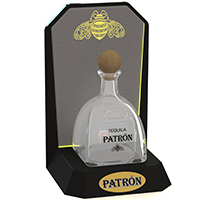 All of our metal bottle glorifiers and back bar displays can be made into illuminated bottle glorifiers by simply adding an LED light to the bottle glorifier or back bar display. Custom Back Bar Displays powered by MRL Promotions allows our clients to have full customization over their metal bottle glorifier and back bar display. An attractive and creative custom tap handle is a great way to make your company stand out against the many other beer companies behind the bar. Enhancing your brand’s visibility with a custom tap handle will undoubtedly create brand awareness, resulting in increased revenue. Custom Back Bar Displays powered by MRL Promotions is a leader in creating custom tap handles that meet any specification. Tap handles can be made of resin, wood, acrylic, ceramic, polyurethane, or epoxy. 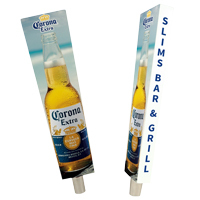 Custom Back Bar Displays powered by MRL Promotions can custom design a tap handle in any shape, size, design, or color. Contact us today to order your custom tap handle. Custom Back Bar Displays powered by MRL Promotions provides an assortment of trendy and high-quality flight trays that can differ to meet any style, size, design or material. Our flight trays can be manufactured from wood, acrylic and even metal, and easily imprinted with your company’s logo. Custom Back Bar Displays powered by MRL Promotions is a leading promotional advertising agency that specializes in designing and customizing flight trays. We are committed to providing our customers with distinct flight trays that will help their brand stand out.